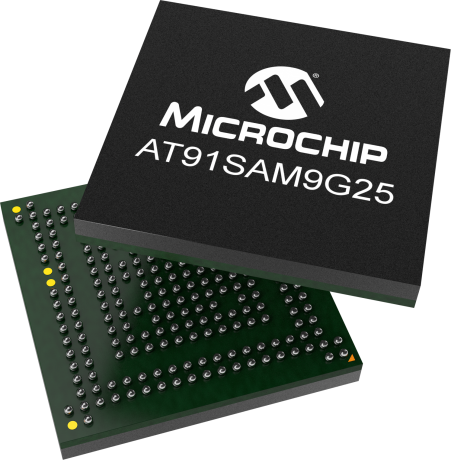 The Microchip's ARM®-based SAM9G25 is based on the ARM926EJ-S core. The SAM9G25 runs at 400 MHz and features connectivity peripherals, high data bandwidth architecture, and a small footprint package option, making it an optimized solution for industrial applications. Peripherals include a soft modem supporting exclusively the Conexant SmartDAA line driver, High Speed (480Mbps) USB Host/Device ports and Full Speed USB Host with on-chip transceivers, 10/100 Ethernet MAC, two HS SDCard/SDIO/MMC interfaces, USARTs, SPIs, I2S, multiple TWIs and 10-bit ADC. It offers support for 8-bank DDR2 and for LPDDR, SDRAM/LPSDRAM, static memories, as well as specific circuitry for MLC/SLC NAND Flash with integrated ECC up to 24 bits. The SAM9G25 is available in a 217-ball BGA package with 0.8mm ball pitch, as well as a 247-ball BGA package with 0.5mm ball pitch. The SAM9G25-EK Evaluation Kit enables evaluaton and code development of applications running on a SAM9G25 device.